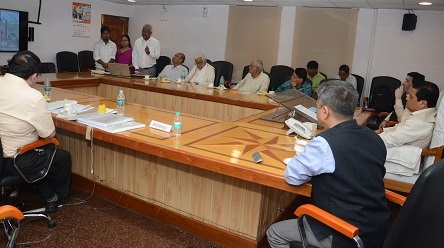 Assam CM Sarbananda Sonowal reviewing the design and decorative structure of the proposed Srimanta Sankardeva International Museum to be set up at Srimanta Sankardeva Kalakshetra in a meeting held at Janata Bhawan in Guwahati on November 14, 2018. In order to take forward Mahapurush Srimanta Sankardeva’s multifaceted personality and contribution in many hues to humanity at large, the Government of Assam would produce a movie on the life and works of the great spiritual reformer. Chief Minister Sarbananda Sonowal directed the Cultural Affairs Department to initiate necessary steps for making this hallowed objective into a reality. While reviewing the design and decorative structure of the proposed Srimanta Sankardeva International Museum to be set up at Srimanta Sankardeva Kalakshetra in Guwahati in a meeting at his conference room in Janata Bhawan on Wednesday, Chief Minister Sonowal said that Srimanta Sankardeva’s personality stretched beyond the identity of a cultural connoisseur, spiritual reformer and religious preacher. He was a legend with universal thought and vision who laid the foundation of a pluralistic Assamese society by bringing people of different ethnicities together to form the greater Assamese identity. “The young generation needs to know more about Sankardeva’s towering personality, his contributions to world humanity as well as building Assamese culture and society. Along with the proposed international museum, the film would be an appropriate initiative to showcase his universal personality to world audience,” he averred. Moreover, laying stress on building the proposed international museum into a centre of spiritual learning, the Chief Minister viewed that the structure should be able to induce devotional attachment among visitors and delineate a strong message on spirituality and universal values.